Today I wore a stripey little top that I’d cooked up a few nights ago. It was supposed to be a dress but when I washed the fabric the black stripes bled into the other stripes in places and I ended up with less than a metre to work with. Chuh! Least it was only £1 a metre, courtesy of Jack’s Fabrics! You can even see some scraps left over in the background (ahem: I’m normally a lot tidier promise). A girl at work said something nice about my top which is always appreciated. My boyfriend nearly convinced my to sew a huge bow to the front of the top but I thought I looked deranged so I’m glad I didn’t. He’ll read this later and I bet he’ll try and make out it was my idea in the first place. Bah, lies. Now I’m going to cook up what I’ll wear tomorrow and possibly pinning something new like my Vogue 8723 pattern! MMM12: Days 4 and 5. WASABI!!! Thanks! 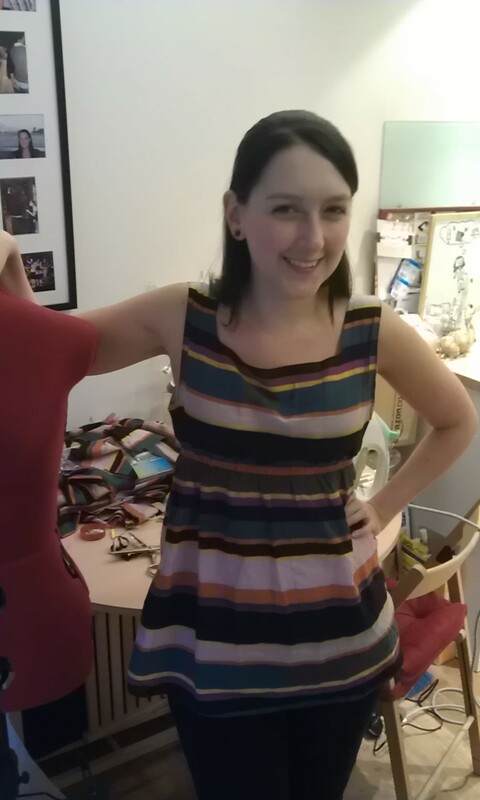 It’s made from Butterick 5644 which is super easy to make and super easy to alter a little to have a square neck.